Undeniably the reigning virtuoso of the violin, Itzhak Perlman enjoys superstar status rarely afforded a classical musician. Beloved for his charm and humanity as well as his talent, he is treasured by audiences throughout the world who respond not only to his remarkable artistry, but also to the irrepressible joy of making music, which he communicates. In December 2003 the John F. Kennedy Center for the Performing Arts granted Mr. Perlman a Kennedy Center Honor celebrating his distinguished achievements and contributions to the cultural and educational life of our nation. He recently performed at the State Dinner for Her Majesty Queen Elizabeth II and His Royal Highness The Prince Philip, Duke of Edinburgh, hosted by President George W. Bush and Mrs. Bush at the White House. Mr. Perlman is a frequent presence on the conductor’s podium, and through this medium he is further delighting his audiences. He has performed as conductor with the New York Philharmonic, Chicago Symphony, Philadelphia Orchestra, Boston Symphony, National Symphony, Los Angeles Philharmonic, St. Paul Chamber Orchestra, and the symphony orchestras of San Francisco, Dallas, Houston, Pittsburgh, Seattle, Montreal and Toronto, as well as at the Ravinia and OK Mozart festivals. He was Music Advisor of the St. Louis Symphony from 2002 to 2004 where he made regular conducting appearances, and he was Principal Guest Conductor of the Detroit Symphony from 2001 to 2005. This season he conducts the Los Angeles Philharmonic, San Francisco Symphony, New World Symphony, and Toronto Symphony. Internationally, Mr. Perlman has conducted the Berlin Philharmonic, Concertgebouw Orchestra, London Philharmonic, the English Chamber Orchestra, the Tonhalle Orchestra and the Israel Philharmonic. As soloist, Mr. Perlman continues to visit major centers throughout the world. Highlights of his 2007-08 season include summer performances with the Philadelphia Orchestra at the Mann Center and Saratoga Performing Arts Center and with the Boston Symphony at Tanglewood; recitals throughout Europe and the United States including London, Paris, Brussels, Zurich, Boston and Los Angeles, and a tour of Japan where he will be heard both in recital and with orchestra. Mr. Perlman also appears with students from the Perlman Music Program in a three-concert series at the Metropolitan Museum of Art in New York. Mr. Perlman has entertained and enlightened millions of TV viewers of all ages on popular shows as diverse as The Late Show with David Letterman, Sesame Street, the PBS series The Frugal Gourmet, the Tonight show, the Grammy awards telecasts, and numerous Live From Lincoln Center broadcasts, including The Juilliard School: Celebrating 100 Years in April 2006, and PBS specials, including A Musical Toast and Mozart by the Masters, in which he served both as host and featured performer. In July 1994, Mr. Perlman hosted the U.S. broadcast of the Three Tenors, Encore! live from Dodger Stadium in Los Angeles. In March 2006, a worldwide audience in the hundreds of millions saw Mr. Perlman perform live on the 78th Annual Academy Awards telecast, as he performed a medley from the five film scores nominated in the category of Best Original Score. One of Mr. Perlman’s proudest achievements is his collaboration with film score composer John Williams in Steven Spielberg’s Academy Award winning film Schindler’s List, in which he performed the violin solos. He can also be heard as the violin soloist on the soundtrack of Zhang Yimou’s film Hero (music by Tan Dun) and Rob Marshall’s Memoirs of a Geisha (music by John Williams). Itzhak Perlman’s recordings regularly appear on the best-seller charts and have garnered fifteen Grammy Awards. His latest Grammy was awarded for The American Album, with Seiji Ozawa and the Boston Symphony Orchestra. His most recent releases include an all-Mozart recording with the Berlin Philharmonic (EMI) with Mr. Perlman performing as both soloist and conductor and a recording for Deutsche Grammophon with Mr. Perlman conducting the Israel Philharmonic. Other recordings reveal Mr. Perlman’s devotion to education, including Concertos from my Childhood with the Juilliard Orchestra under Lawrence Foster (EMI) and Marita and her Heart’s Desire, composed and conducted by Bruce Adolphe (Telarc). Other recordings over the past decade have included a Grammy-nominated live recording with pianist Martha Argerich performing Beethoven and Franck Sonatas (EMI); Cinema Serenade featuring popular hits from movies with John Williams conducting (Sony);A la Carte, a recording of short violin pieces with orchestra (EMI) and In the Fiddler’s House, a celebration of Klezmer Music (EMI) that formed the basis of the PBS television special. In 2004, EMI released The Perlman Edition, a limited-edition 15-CD box set featuring many of his finest EMI recordings as well as newly compiled material and RCA Red Seal released a CD titled Perlman reDISCOVERED which includes material recorded in 1965 by a young Itzhak Perlman. 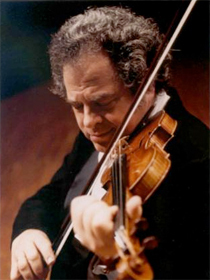 Numerous publications and institutions have paid tribute to Itzhak Perlman for the unique place he occupies in the artistic and humanitarian fabric of our times. Harvard, Yale, Brandeis, Roosevelt, Yeshiva and Hebrew universities are among the institutions, which have awarded him honorary degrees. He was awarded an honorary doctorate and a centennial medal on the occasion of Juilliard’s 100th commencement ceremony in May 2005. President Reagan honored Mr. Perlman with a “Medal of Liberty” in 1986, and in December 2000, President Clinton awarded Mr. Perlman the “National Medal of Arts.” His presence on stage, on camera and in personal appearances of all kinds speaks eloquently on behalf of the disabled, and his devotion to their cause is an integral part of Mr. Perlman’s life.